Back on 14 January Larry and Shari Zirlin were fortunate enough to come across an amazing three Northern Lapwings in a field in New Egypt, New Jersey, while out looking for a pair of reported Sandhill Cranes. I had been wishing I could get to see them but between family and job it just wasn’t working out for me to make the 90-minute ride to New Egypt. It also seemed kind of silly to go that far out of my way for a species that I just saw in November in Montauk. But yesterday I had a meeting in southwestern New Jersey that was scheduled to start at 9 AM, which meant that I had to leave the house before Desi was awake anyway. And once I realized that I did some quick calculations and realized that if I left an hour-and-fifteen minutes early I could create a forty-five minute window in which to find and appreciate the lapwings. You will not be surprised, therefore, to learn that I was out of my house in Queens by 5:40 AM and at the lapwing site by 7:10 AM, only to meet another birder who had not yet had the birds. (He was nice and helpful but apparently has a forgettable name because I can’t for the life of me remember it.) I did have perfect timing as it related to the arrival of the Sandhill Cranes though! From now on when it is really cold out I am going to say “It is so cold that the sandhills are footless!” How weird to see Sandhill Cranes flying in without any legs. They almost looked like swans if you squinted a little bit. You know that it is cold when they have their bare parts pulled in among their feathers for warmth. Anyway, my fellow birder and I scanned and scanned and scanned and scanned and could not come up with the lapwings. Eventually he had to head out to take his daughter to school. I stayed and scanned and scanned and scanned. 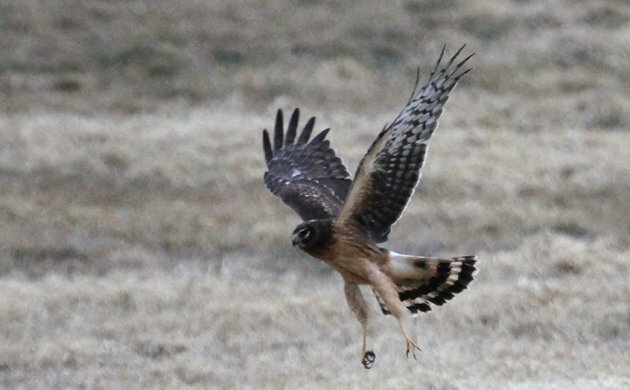 I was just about to give up because I was concerned about making my meeting on time when a Northern Harrier started quartering the field in which the lapwings were reported to have gone to roost the night before. It didn’t take long for the three lapwings to take exception to the presence of a predator and take to the sky! I watched them for a bit but couldn’t stay long. Nonetheless, it was a heck of a way to spend some time before work and the Northern Lapwings were a wonderful addition to my paltry year list! Lapwings…..sweet. I just got acquainted with the southern variety. The shot of the legless cranes is priceless. GHANA – Upper Guinea Forest Birding at its best!